New York  Speaking at the Ukrainian Institute of America today, New York's First Lady Libby Pataki announced that she will accompany a group of volunteers to present a delivery of wheelchairs to be donated in Ukraine. Mrs. Pataki will meet with First Lady of Ukraine, Katya Yushchenko, in Kyiv on June 13 to launch the wheelchair distribution project. 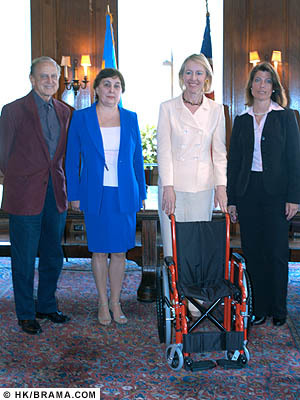 At the forefront of this project is the Wheelchair Foundation, which has committed 3,628 wheelchairs in all to Ukraine. So far, with the assistance of organizations such as the Ukrainian American Medical Association and Self-Reliance NY Federal Credit Union, funding has been raised for 560 wheelchairs. The Chopivsky Foundation contributed 100 of these. Transport for the first container of 280 wheelchairs was provided by Lufthansa Airlines. United Ukrainian American Relief Committee representatives are joining the delegation and will be assisting with the distribution of the wheelchairs to the needy in Ukraine.